You probably use Facebook too much and don't play board games enough. That's not right! 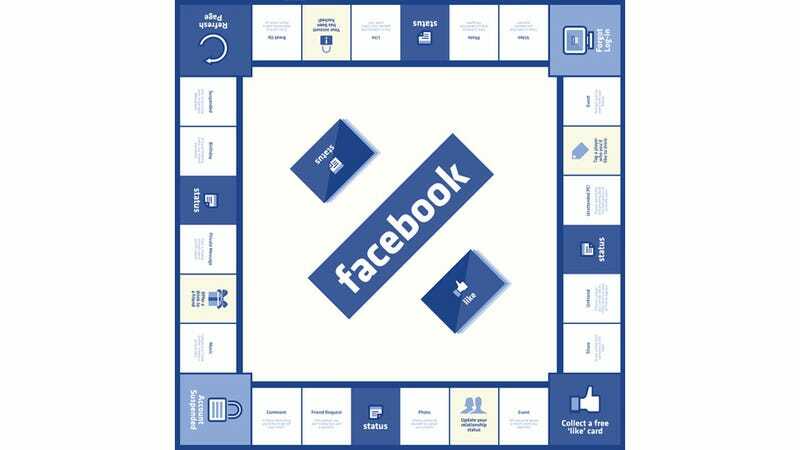 But what if Facebook was a board game instead? How would it work? Graphic designer Pat C. Klein imagined Facebook as a board game and came up with some clever Monopoly-style rules. Klein cooked up this Facebook: The Board Game because he was worried that spending all of our waking hours booking the face was ruining our real life communication skills. So he wanted to re-invent the Facebook experience as a group activity (and no, scrolling through Facebook pictures of 'friends' with your buddy isn't the group activity he's talking about). In Facebook: The Board Game, things like Status become sharing good news or revealing future plans. Stuff like Video would force you to watch a video with somebody. Features like Events would encourage you to plan a gathering with a player. It's a sweet idea with hilarious penalty tiles like 'Unattended PC' which allows a player to "reveal something embarrassing about the next person to leave the room" and 'Break Up' which forces people in relationship to break up. I think it'd be a lot more fun than the real Facebook.